JLT Employee Benefits has updated its monthly index, showing the funding position of all UK private sector defined benefit (DB) pension schemes under the standard accounting measure (IAS19) used in company reports and accounts. 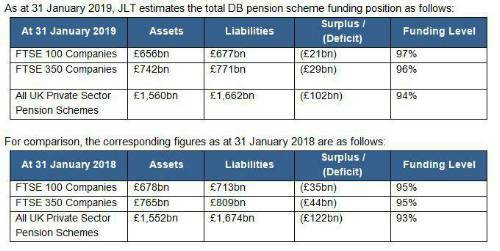 Charles Cowling, Chief Actuary, JLT Employee Benefits, comments: “Despite the political turmoil in Westminster and across the EU, the start of 2019 has seen little change to the aggregate position for FTSE 100 pension schemes which continue to show a modest overall deficit. Markets seem to be holding their breath as the political dance around Brexit becomes ever more tortuous.